In a world where speed and flexibility are valued more than ever, leaders from the corporate boardroom to the military are looking for answers from seemingly unlikely experts -- the ones in the grass, in the air, in the lakes, and in the woods. 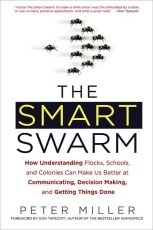 In this innovative book, veteran National Geographic editor Peter Miller explains the basic principles of smart swarms -- self-organization, diversity of knowledge, indirect collaboration, and adaptive mimicking -- to show how swarm species such as ants, bees, and fish can teach us to tackle some of the most complex conundrums in business, politics, and technology. By studying ant colonies' simple governing rules, computer scientists have written programs to streamline factory processes, telephone networks, and truck routes. Termites have inspired climate control solutions, and the U.S. military is developing a team of robots that behaves like a school of fish. Groups in nature are the real specialists because they've evolved strategies over millions of years to cope with uncertainty, complexity, and change -- the same challenges that make our lives and businesses difficult today. Leading scientists in fields from biology to physics, social psychology, and business management are all studying smart swarms to unlock their secrets, and Peter Miller takes us on a lively tour to show us how we can, too. A fascinating journey from the critter to the corporation, The Smart Swarm is an eye-opening look at small-scale phenomena with big implications for us all.